I have a lot of passwords. Like, somewhere in the range of 50 or so for various work stuff, email, home server, websites, etc. I don’t know about anybody else, but I can’t remember that many passwords let alone keep track of which ones change or expire. In this post I will be going over a way to keep passwords centralized in one place, secure and available to me whenever I need them (for the most part). On top of that this is a great way to keep all of your passwords up date easily. Because I am always creating new accounts or changing existing account passwords this is essentially the best way that I have found to do it over the years. It is a fairly simple idea in practice so let’s get going. You will need a few things first. Download and install Dropbox on any and all of the computers that you will want to view/edit or create username and passwords on. I like Dropbox because it works cross platform so I can sync my folders on a Linux, Android iOS or Mac OS system like I would on a Windows box, which is pretty handy. Oh yeah, and its free. Next we are going to need to go get a program called KeePassX. This is what actually keeps track of your passwords. This project was spawned originally from KeePass. One very nice feature is that the password database files are compatible across programs so if you don’t like KeePassX you can check out KeePass and everything will just work, and vice versa, going from KeePass to KeePassX. I like this program because like Dropbox it is cross platform, reliable, free (Open Source), has some pretty handy features and is super easy to use. Ok sweet, now that we have the tools we need it is just a matter of getting up and going. Not a lot of configuration but there are a few steps. The first is to make a home for you password file and your encryption key (if you want to use two factor authentication) inside Dropbox. I made a folder called “keepassx” to put my crypto key, “keepassx” and my password file “passwords.kdb” in there. But we need to create these files with KeePassX before we can put them in our Dropbox folder. Easy enough, most of these should be pretty much self explanatory so if I miss something let me know. So this is the screen you get when you open up KeePassX by default. If you already have your password file created just enter your master password and your key file (encryption key) if you created one to open up your password list. If this is the first time opening the program choose a master password and decide if you want to use an encryption key. 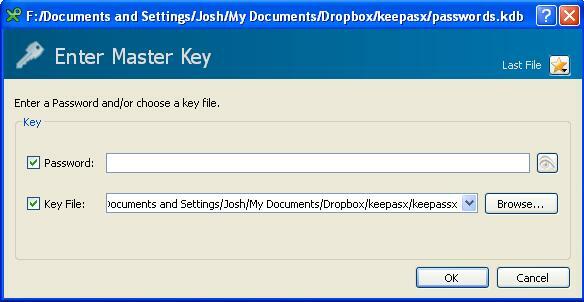 The encryption key, should you choose to make one, will be one of the files that goes into your Dropbox folder to be synchronized. NOTE: The password pictured above is your master password and should be chosen carefully. It should be unique, have as many unique characters and as much entropy as possible if you want your password file to be as secure as possible. Once you have created your password/encryption, the rest is easy. Take a spin, create some password entries, build a few groups whatever you want just so we can get some data into the password database. Then just save your file and choose the path to Dropbox that you chose. Now from whatever other device you would like to access this from just open KeePassX, enter your password and browse to the location you set for your password file.